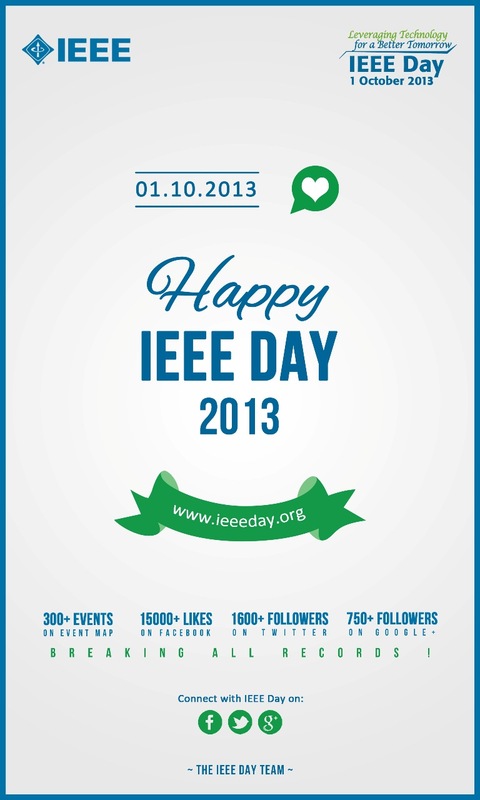 We wish you HAPPY IEEE Day! IEEE members from all over the world will celebrate what motivates and excites them about IEEE. Thank you for being part of this and sharing your enthusiasm! Over 300 events have pinned on the IEEE Day 2013 Events Map! Don’t forget to submit your pictures for our photo contest and grab the opportunity to win up to $750 just by showing how awesome your activities were. Please check the contest rules before your events. The Photo Contest will open on Tuesday, October 1, 2013 and will close on Tuesday, October 8, 2013 at 23:59 UTC. All the photos will be shared by official IEEE Day Facebook page on the same album named “IEEE Day 2013 Photo Contest Photos for Official Voting” and this album will be available on 9 October 2013 11:59 AM UTC (GMT). The voting closes on 19 October 2013 23.59 UTC (GMT) !! We are planning to make an IEEE Day 2013 video after the events, if you want to take your place, please record short videos from the the most exciting moments of your events and send it to ieeeday2013@ieee.org. Let’s start moving the world forward. Join IEEEDay and help us “Leverage Technology for a Better Tomorrow”.